Credit: NASA/CXC/SAO/J. Drake et al. The V471 Tauri system comprises a white dwarf star (the primary) in a close orbit - one thirtieth of the distance between Mercury and the Sun - with a normal Sun-like star (the secondary). The white dwarf star was once a star several times as massive as the Sun. Chandra data on this system provide the best evidence yet that a star can be engulfed by its companion star and survive. The illustration shows X-ray spectra made by Chandra's Low Energy Transmission Grating Spectrometer of two individual stars and V471 Tauri: a red giant star (Beta Ceti, top panel), V471 Tauri, and a Sun-like star (Epsilon Eridani). The peak in the spectrum due to carbon ions is much smaller in the giant star than in the Sun-like star, whereas the carbon peak in V471 is intermediate between the two. These differences provide important clues to the different evolutionary histories of the stars. If the companion star manages to survive, it will bear the marks of its ordeal in the form of contamination by carbon-poor material that it accreted while it was inside the red giant envelope. 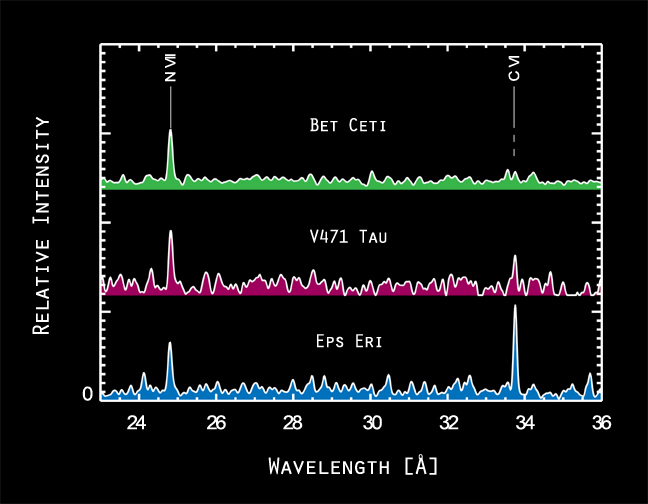 The X-ray spectrum of V471 Tauri in the middle panel shows just this effect - the carbon peak is intermediate between that of a Sun-like star and an isolated red giant star. The data indicate that about 10 percent of the star's mass has been accreted from the red giant. Credit NASA/CXC/SAO/J. Drake et al. Coordinates (J2000) RA 03h 50m 25.00s | Dec +17° 14’ 47.40"